Yesterday we went to sfraw for the first time to check out what they are selling. To be honest, I was a bit disappointed as many of the items listed on their website weren't available and the prices were kind of high. I was kind of sad because the one thing I really wanted was green tripe and they didn't have it this week. We ended up spending around $75 and got a huge bag of beef hearts, a big bag of duck legs, some chicken hearts and chicken bone-in cuts. On our way home, we also stopped by a Chinese supermarket and got some duck gizzards, chicken gizzards, pork kidneys and smelts. The real "fun" began after we got home. We spent about two hours slicing and bagging the meat/organs/fish to meal size portions, labeling everything and fitting it all into our small freezer (while Maya sat there looking desperately at us). 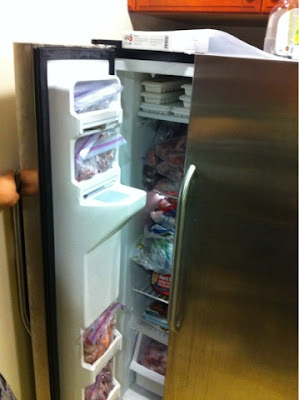 I hope these supplies will last for a while, cause I really don't want to touch raw meat again anytime soon. 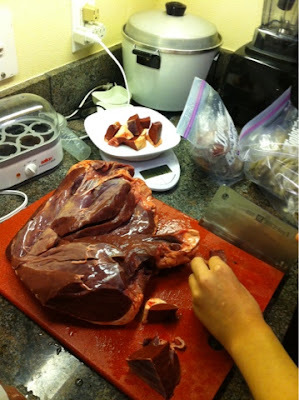 Wow, I've never actually seen a whole beef heart. IT IS HUGE. Dang! I wish I could get whole beef heart, that thing is huge. 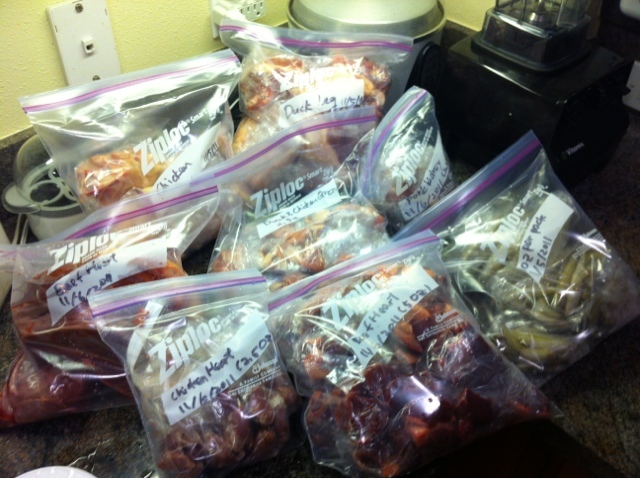 I'm stuck with just chicken hearts and occasionally turkey hearts. I am surrounded by farms but have yet to find one who'll sell me the oddities. I can't even find whole raw fish here due to a lack of ethnic markets.